There are many types of feeders available. 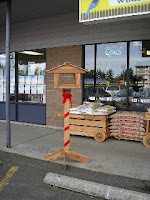 Any one or a variety of feeders will attract birds to your yard. Deciding on a feeder should be based on functionality, appearance, maintenance required, and the birds you have seen or would like to attract. This feeder has an enclosed area to store seed and is dispensed by gravity. A hopper feeder will be visited by a good variety of birds including sparrows, finches, chickadees, jays and any other seed eating bird that can get to the seed. A quality hopper feeder will have a large roof overhang to keep the seed as dry as possible. This is Vancouver Island after all! Wet seed can be harmful to the birds so it is important to clean the feeder and remove wet seed regularly. You can fill a hopper feeder with a quality birdseed blend, or separate each type of seed with dividers to allow birds to choose their favorite seed with less waste. This feeder is a flat open tray, it may or may not have a roof. All birds like to use a tray feeder, similar to those visiting the hopper type feeder. Tray feeders are great for viewing the birds at your feeder without obstacles interfering. A generous overhang will help to keep the seed dry and avoid waste. Some feeders will have a removable tray with drainage for easy cleaning, and others have a mesh floor to allow any moisture to drain and air to circulate through the seed. 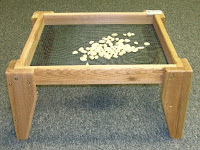 Any quality seed mix or separate types of seed will attract birds to your tray feeder. This feeder does require more frequent filling than others as it has less seed capacity than a hopper. This type of feeder is an upright tube with perches down the sides. Tube feeders will attract perching birds such as finches, chickadees, nuthatches, and even woodpeckers. Generally all these birds prefer black oil sunflower seed rather that a mix. We recommend using only the black oil sunflower in these feeders as mixes containing millet will become wet and sticky, making cleaning difficult. Ground feeding birds who prefer millet will visit your tray and hopper feeders. 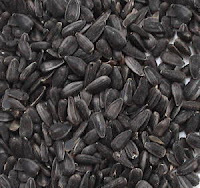 To decrease the spill of the shells and unwanted seed on the ground beneath your feeder, hulled sunflower seed can be used if the feeder is somewhat sheltered from wetness. Finches and woodpeckers do prefer the hulled seeds or those in the shell. This feeder is designed to hold suet cakes. They vary in design from a wire cage to wood or other ornamental designs. Suet can be purchased in a variety of types and flavors to attract the birds. Suet cakes can also be made at home. (Though it’s a little messier than opening a package) The birds attracted to a suet feeder are woodpeckers including flickers, as well as chickadees and nuthatches. A suet feeder is a great addition to your backyard feeding as it is low maintenance and minimum mess. This feeder holds sugar mixture (nectar) to attract hummingbirds. 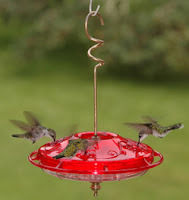 Hummingbird feeders can be found in a large variety of shapes and sizes, plastic or glass, from simple to artistic. Red and fuchsia colours attract hummingbirds. A good feeder will be easy to open, clean and fill. It is important to empty and clean at least weekly as the birds will not visit a feeder with fermented nectar. The sugar nectar can be purchased in powder form, but is easily mixed at home using 1 part sugar to 3 or 4 parts boiled water. Do Not add red food colouring, it is not necessary and may harm the birds. Do not use honey or raw sugars. Nanaimo is special because the Anna’s hummingbird winters in a growing region of the city. In these areas near it is enjoyable to keep your feeder maintained through the winter. Now that you have your bird feeder and bird seed where are you going to hang the feeders to attract the birds? As much as we are placing out bird seed to help the birds, we are also doing for our enjoyment. So place your feeder in an open area easy for the birds to find and you to see. Birds find food by sight and sound. Birds don’t have very advanced smelling capabilities. So it is important when hanging your feeder in a tree to hang it where it will be visible to the birds. 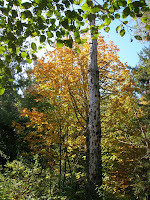 If it was hung near the trunk of the tree it may be hidden and take longer for the birds to find the feeder. Place your feeder near a shrub or tree so the birds can make a quick escape if threatened by predators. Many types of seeds are available both in mixes or on their own. Each bird has its own preference, and will have a tendency to sort through mixes to find its favorite. The rejected seeds will likely end up on the ground. Using more than one feeder and separating the seed types can eliminate this waste. A good quality mix will also decrease the wasted seed. Many commercial mixes, especially those that seem to be "too good a deal” contain filler of grains and other seeds that the songbirds do not eat. Preferred mixes contain black oil sunflower seeds, peanuts, millet and hulled sunflower seeds in varying quantities. The type of seed you choose depends on bird species you are feeding or attracting, time of year, location, and type of feeder. This post is under construction...more to come. There’s more to birding than looking out your patio window, though it is a good start! Armed with a few of supplies and a bit of information, you can discover an entire world you never knew existed. Right in your own backyard! 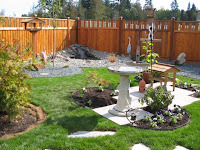 Providing the basics can be as simple as a tray of water, a mound of seed and a nearby shrub or you can invest in your backyard success by adding a birdbath with dripper, a quality feeder and a nest box. Enjoy the variety of bird species visiting your yard using a field guide to identify the newcomers to your yard. A pair of binoculars are helpful to get a closer look. 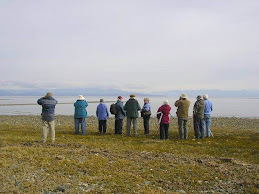 By identifying and observing the many birds you see the "hobby" of bird feeding and bird watching can be very inviting! Remember! Help is just a phone call or an e-mail away! As a family business we are committed not only to quality products, but excellent service as well. Information is important so you can enjoy birds and nature in your backyard. We hope this blog will provide the essential information and guidance that it takes to make backyard birding an enjoyable and educational pastime for the whole family. Helping people to create a backyard oasis through has always been the main objective of The Backyard Wildbird & Nature Store. We carry a growing selection of birding and nature products that work with minimum of maintenance for the most enjoyment. 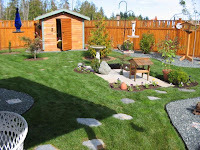 We offer feeders that protect seed from rain, and the correct seeds to use in each of the feeders and products to attract other creatures of nature to your backyard. All of our products and instructions are based on personal experiences. The Backyard Post Mount Feeder.